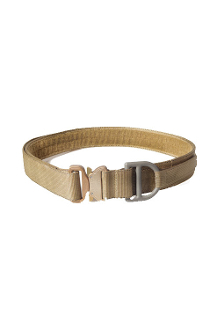 Sewn with strength and attention to detail, this belt is equipped with the proven quick release COBRA buckle. HSGI® Cobra Rigger's Belts are constructed of 2 layers of 1.75" Type 13 webbing sewn together with 5 rows of bonded 138 nylon thread. To add additional rigidity and stiffness, the layers are laminated with an industrial strength adhesive before sewing. Loop velcro is sewn on inside of this version to provide stabilty for the Sure Grip Padded Belt or velcro belt holsters. This belt is built to perform. Buckle color matches belt. HSGI's® Riggers Belts are NOT labeled or certified for climbing or use as Life Saving Equipment. HSGI® will not be held responsible for any injuries or death for the misuse of any of our products. Covered by HSGI's Lifetime Warranty. Made in the USA.